Thomas Carlyle had it right: All history is a biography – as so all great companies and organizations, including schools, are indeed the direct reflection of their leaders. The leader sets the tone, the mood, the style, and the character of the whole enterprise. In part one of this post I spoke of the tragedy of Hall and Fisher, but to me the greatest story on leadership is from accomplished climber David Breashears, the leader of the IMAX film crew in 1996. While everyone else was headed for the summit, he sought the advice his team. The conditions did not feel right to him. His team concurred and they turned their team around and headed back to base camp. They all recalled questioning their decision when meeting the other teams on their way up while they were retreating. Breashears argued that experience, formal authority, or expertise in one’s field do not make someone a great leader. Sometimes it is just as important to practice restraint when making decisions. I can really relate to this as a leader of a turnaround academy. There are so many resources and “the next great program,” coming at me that sometimes I have to say, “No, we are sticking to what we know works best for learning.” Additionally, we must also be able to accept others’ ideas without being threatened. Wow, what a statement by a great leader! While speaking at Harvard University, Breashears stated: “Some people have tremendous charisma, and they can dominate a room full of people, but all of that does not equal competence. Sure, leaders need to have a vision. But by restraint I mean the ability to accept others’ ideas without feeling threatened. Those are the people I found to be my role models – not the person who ordered me to go up the mountain, but the person who talked to the team, asking for a dialogue, not feeling threatened by the dialogue, because they still had the ability to make the final decision. Some people can tolerate no dissent. But, if you assemble a great team, don’t you want to hear their ideas” (Roberts, 2011, p. 24). Breashears is a Mount Everest size leader! I practice this with all decisions. Pulling in all the team members that are appropriate to the decision has become standard operating procedure for me. Some have criticized, saying I can’t make a decision. Ultimately, however, I do make the decision and accept responsibility for the outcome. We have assembled a great team at our school, and guess what? I want their dialogue, dissent, and ideas! Roberts, M.A. (2011). Leading with restraint. FTPress Delivers: Upper Saddle River, NJ. I realize that all the credit for the idea of fireside chats goes to Franklin Delano Roosevelt but I want to share with you something that started spontaneously at our school and has turned into an important part of our culture. 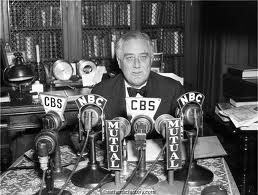 Just as FDR used the chats to bring awareness to the American public. We use these to bring awareness about our world as a turnaround academy. These fireside chats started as a group of teachers mingling in my office after school, particularly on nights when there was an hour or two gap between school letting out and an athletic event. Most principals use this time for catching up on paperwork or the likes – not me! We use the time for our staff to get together in my office to vent, share ideas, make me aware of issues, laugh, and even cry. Honestly, many great ideas, procedures, and programs we now have in place came from these fireside chats. Interestingly enough we called them fireside chats without a fire. 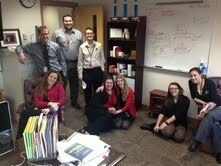 Then word got out about our fireside chats and some students bought me a small electric fireplace for my office. This has become one of my most valued possessions in my office. You can see it in the picture – look close under the white board or you might miss it. In the great book, TouchPoints: Creating Powerful Leadership Connections in the Smallest of Moments, Douglas Conant discusses the interruptions that leaders face interacting with their staff are actually moments that give the opportunity for awareness and leading in the largest of proportions. 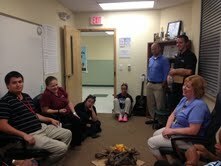 Amazingly I had a lengthy fireside chat with some teachers today and also amazingly I got an email from an assistant principal of a school in our network of schools that had started “campfires” after hearing a presentation I made on our fireside chats. I really believe the email exchange between us does the best job of describing the thoughts I would like to present in this post. I wanted to share how much I appreciated “Camp Fire”. The advice/counsel that I was given will definitely help me grow in my position. I left those moments with a sense that not only am I valued as an employee but as an individual. I guess that’s what happens when we take the time to validate a student’s concerns/feelings. Thanks again and I look forward to an amazing year! Hope you had a great first few weeks of school! Thanks again for sharing your ideas that support and value our people! I want you to know words cant describe how much your email means to me! Thank You! We want to be a contributor of best practices to our network, and really believe that the “camp fires,” or “fireside chats” as we call them, are one of those. These started spontaneously, but have become an important part of our culture. 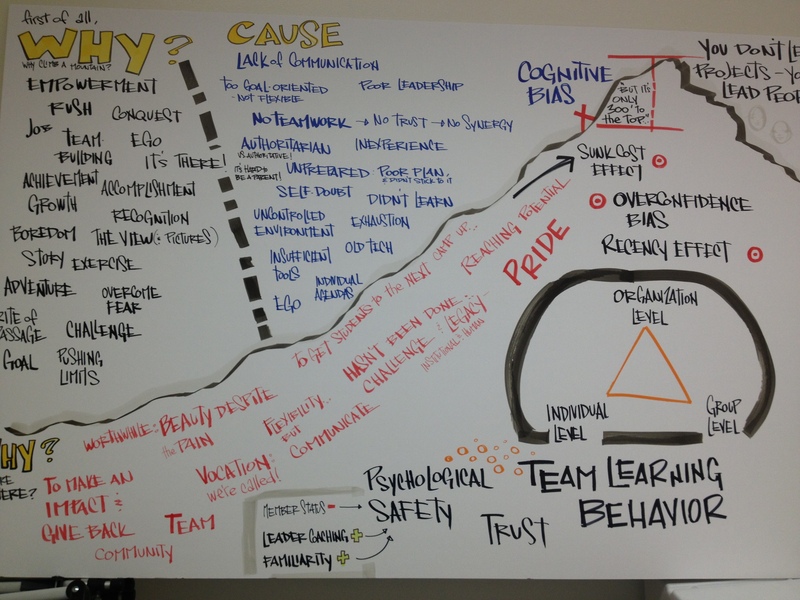 These “touchpoints,” as I like to a call them, are important to us as leaders for awareness. Additionally, your timing of this email is impeccable! I just finished a fireside chat with seven teachers who were in the building today, that started at 11:15 and just ended at 3:15, and was feeling a little frustrated that I had got nothing I had planned to do done. But guess what? Your email reminded me that there was nothing we could have done today that was more important to teaching and learning, putting our teachers first, and most importantly our students first, than the 4 hours we spent having a fireside chat! So, thank you for getting me in check, and the email. I am so excited about this! Please, let’s stay in touch about how your campfires evolve. How COOL is what we do? Seriously, how cool is this! So next time you think you are wasting time talking with the people you lead, remember these could be the moments where the greatest leadership opportunities lie! This past week during our Power Week Staff Training I modeled using a case study for facilitating learning for our staff. It was on e of the first sessions and I was amazed at how we then looked back to the case study I chose, Mount Everest – 1996, the rest of the week. I understand why Harvard University uses the case study method to teach their classes and am glad I had the opportunity to learn this method from Harvard first hand. Today, I begin Part 1 of a three part post to my blog using Mount Everest – 1996 as the focal point. 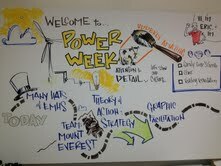 The case study of Mount Everest – 1996 also gave powerful imagery for the graphic facilitation we were also using for our week long of learning (see insert picture). If you are not familiar with the events on Mount Everest in 1996 I suggest you put Into Thin Air: A Personal Account of the Mount Everest Disaster (1997) by Jon Krakauer on your 2013 must read list. There was both incredible achievement and great tragedy on Mount Everest in the spring of 1996. Ninety-eight men and women made it safely to the summit, but 15 did not return. 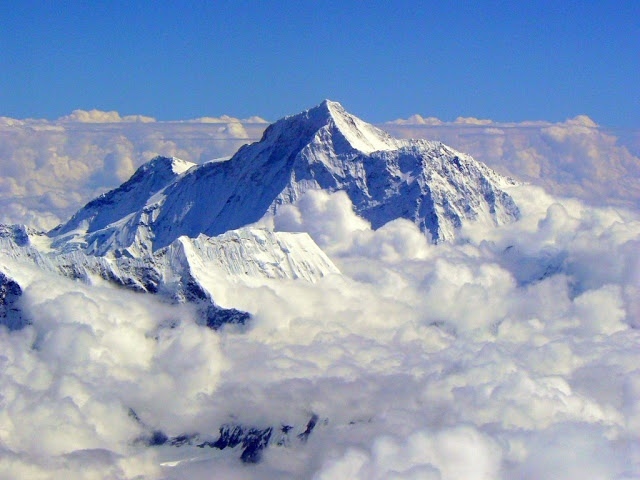 Even some of the world’s most renowned high-altitude climbers, including Rob Hall and Scott Fischer reached the summit, but died during the descent because of a storm. Others barely escaped with their lives, and since then many have sought to understand what happened that day. As a leader, I get why some individuals want to make the climb. It is the idea of being a Trailblazer. Trailblazers go before others go. They don’t send someone where they are unwilling to go themselves. Trailblazers have been up the mountainous leadership challenges so others can come after. This is contrary to a travel agent who sends people places they have never been. Today is the first day of school for the 2013-2014 year for our students. In my role as a Turnaround School Leader I am certainly a Trailblazer. From the list above I strive each day to be an effective Trailblazer leader from the love of doing this. My prayer is to help others involved in this important education reform work be successful and see and do things that haven’t been done before. As we start school today I want us to help blaze the trail for our students in their world of education and learning. Our goal is for all our students to become lifelong learners. John Wooden said: “It’s what you learn after you know it all that counts.” When you are out of school, you are not out of the classroom. Life is the big classroom. I love to learn and I want to share that love with others in the hope it will rub off. John Maxwell puts education in these three steps: 1. Learn; 2. Earn; and, 3. Return. Let’s not stop our learning with the formal education. Be an every day learner to be an every day grower!